From the boat, vast white sand ripples come to the sight first. It takes a good 10 minutes to cross the sand and walk up hills to finally reach Koh Sam village, where most farmers reside in. Vorn and his team set up an outreach services’ site at a village health volunteer’s house to fulfill their mission for the day: providing free vaccines to children under two years old to protect them from diseases such as measles, rubella, polio, and tuberculosis, as well as prenatal check-ups for pregnant women in the village who could easily miss these important routine cares, and tetanus vaccination for women of child-bearing age. 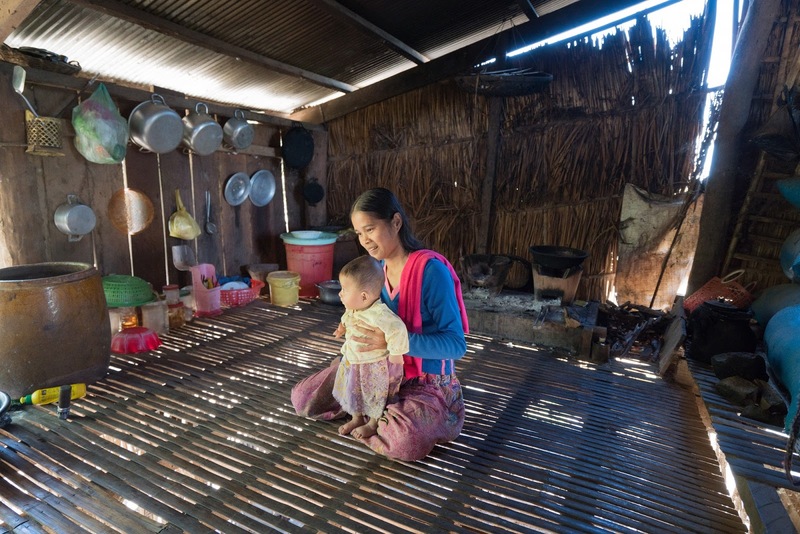 Vorn, a veteran health provider, works alongside with two midwives, Ouk and Nhek. About 15 minutes after the team’s arrival, around 20 women and children show up to receive vaccinations against infections like measles and tetanus. Some children are receiving their first round of vaccines; others are completing final shots that will protect them from a host of deadly diseases. 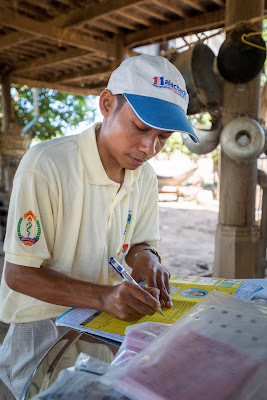 Vorn’s team also provides check-ups for pregnant women and conducts an educational session about the importance of immunization and other critical health matters. Two hours and many tearful cries later, the team has completed their duties without issues. But Vorn’s work isn’t over yet: now he must try and track down the children who were due for vaccines but didn’t make it to the team’s scheduled outreach services. Vorn sits down with a Koh Sam village health volunteer, a community member who helps inform residents about the importance of the immunization and other health outreach services, and when health staff are coming to the village, to identify the children who were meant to receive vaccinations that day. The volunteer then jumps on her motorbike to visit parents and caregivers and remind them of this important session once again. The outreach health team remains on standby until the afternoon to wait for additional children still in need of shots. Most of the time, Vorn brings his motorbike so he can directly visit homes where children need vaccines, hoping to immunize on the spot. 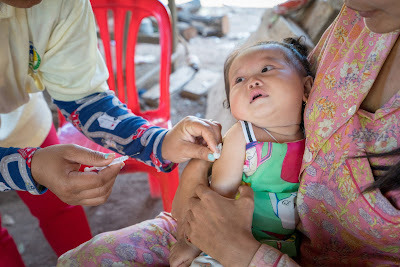 By the end of the day, the team has vaccinated 24 children and 3 pregnant women in the small village of Koh Sam. 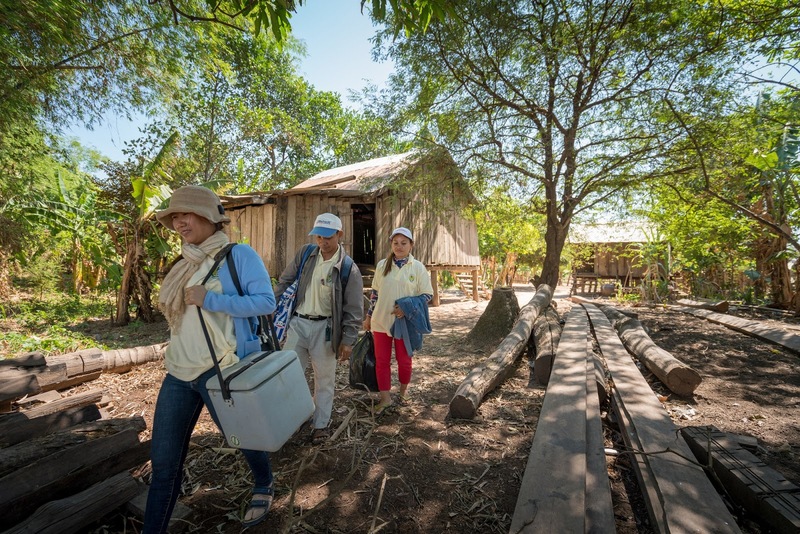 Sambo Health Centre is the nearest clinic to Koh Sam, located about 8 kilometers away. But villagers cannot simply walk there. 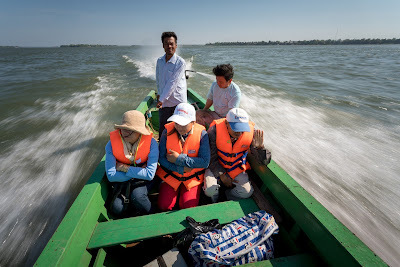 Though it provides a livelihood to many, the Mekong River can also act as a barrier to accessing basic health services as there is no road or bridge connecting Kom Sam village to the other side where Sambo Health Centre is located. Many villagers do not have the means to travel to the health centre, lacking their own form of transport or the money to pay the boat fee. The outreach services are their only opportunity to receive proper vaccination for their children. Hom Bunna’s five-month-old daughter Dy Pheakdey fell behind a routine vaccination schedule. Dy’s supposed to receive vaccinations for the fourth time, but she had received only once. The family was unable to make the trip to complete the child’s first year immunizations and missed the appointment. By this morning, Dy got her second round of shots during the health team’s village visit and is now protected against diseases such as polio and tuberculosis. Vaccination campaigns like these are incredibly important for children like her. “So, if we can conduct health outreach activities once a month, we can ensure more children can receive necessary vaccines to grow up as healthy adults,” he continues. at home after being vaccinated. Despite these efforts, the full immunization coverage rate was only 65 per cent in Kratie Province in 2017. There are many challenges to immunizing every child in this remote, rural area. Many families migrate with their children in search of work, which is typically correlated with lapses in immunizations. Villagers tend to have limited knowledge of health care and the importance of vaccines. What’s more, even if the distances are not so far, tough road conditions make it a challenge for villagers to seek care and for health staff to deliver services in the hardest-to-reach areas. “Especially during the rainy season, roads become slippery, muddy and dangerous. It’s very hard to reach remote areas, even on a motorbike,” Vorn says. But the health care worker remains optimistic. UNICEF provides financial and technical support to the Ministry of Health and its local health facilities like Sambo Health Centre, along with other partners, to immunize children in Cambodia. Communities where total vaccine coverage is low are a priority.